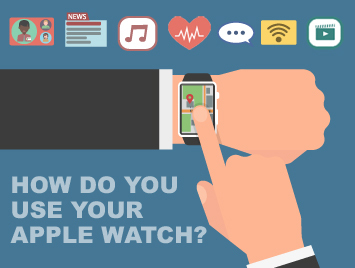 Personal injury and wrongful death attorney Evan Kline was among the first to order the Apple Watch after its release April 24, 2015. Evan is a tech guru, who keeps a blog on the latest gadgets, software and more, at 40tech.com. Below, he answers a few questions about the functionality of the watch and how the technology could improve office workflow. The Apple Watch Sport with a 42mm Space Gray aluminum case and black sport band. I decided to buy the entry-level model because it’s the first-generation version, and tech products often see significant advances with each successive release. I know myself well enough to know that I might not be able to resist the next release. The Watch Sport starts at $349 for the 38mm model. What do you find to be most useful about the watch? One of the greatest benefits of the device is using voice commands to add tasks, reminders, timers and brief notes. At one time, we took notes with a pen and pad of paper. Then we started jotting notes on smartphones and tablets. With the watch you can instruct Siri to add a note, task, or reminder while walking down the street, doing the dishes, or lying in bed, without touching (or looking) at any device. I’ve found it to be a really quick and easy way to capture those stray thoughts we all get, and get on with what I was doing. Raise the wrist, say a few words, such as, “Hey Siri, remind me at noon to call Joe Smith,” and it’s done. Creating private and personalized notifications captures your attention. The Apple Watch solves the problem of people around you being aware of your notifications, even when you’ve set your phone to only vibrate. Since getting my Apple Watch, I’ve turned off all sound and vibrations on my phone. All notifications – even incoming phone calls – go to my watch instead as silent taps on my wrist. You can personalize those notifications just like on the phone, deciding which ones you want to receive. And because you don’t have to dig your phone out of your pocket, you’re less likely to overlook the communication that matters most. For example, I get notifications for emails from my paralegal – and texts from my wife – but have disabled many others. I also set up the watch to receive a weather report every morning when I wake up. Quick snippets of information are easy to access. The Apple Watch isn’t designed to be a full-fledged productivity device. Where it excels is in giving you information quickly. I use the watch to quickly glance at my upcoming schedule, current weather conditions, and even sports scores. It helps you to remember fitness goals. During a busy day, it’s easy to forget about exercise and nutrition. That’s why so many of us fell in love with the FitBit. The Apple Watch takes your goals to another level. Unlike the FitBit, the watch tracks more than just steps. It contains a heart rate monitor, and measures calories, minutes of exercise, and even when you’re standing versus sitting. It presents goals visually, so in addition to measuring your activity it is also incentivizing you. The watch can function as a remote control for Keynote and PowerPoint presentations. A dedicated remote control will still be your first choice for a Keynote or Powerpoint presentations, but a lost remote or a dead remote battery is no longer a huge problem if you’re wearing the Apple Watch. An added benefit over a remote is that you can keep your hands free, and tap the watch to advance through your presentation. What are some of the watch’s shortcomings? The screen only turns on when you raise your wrist or tap the screen. If you’re lying down, for example, the watch struggles to detect when you raise your wrist. In addition, when you wish to open a third-party app, the icons are small and you can occasionally open the wrong app. Many of the third-party apps are slow to open, too, since they are actually running on your phone and transmitting to your watch. Apple announced the next version of the Watch operating system, due this fall, will improve upon this by allowing apps to run natively on the watch. For now, though, the spinning wheel makes an appearance often. Can you talk about the battery life? The battery watch of the Sport model lasts about 18 hours. I consider myself a heavy user, yet 30 to 40 percent of my battery life remains by day’s end. I charge it at night. How do you think the watch can improve workflow? It’s a matter of convenience – the watch’s functions can save you time, and time is money. More than 100 years ago, people transitioned from pocket watches to wristwatches because they realized how pulling a watch out of a pocket was clumsy and time-consuming. Similarly, I think people will realize how clumsy it is to pull a phone out of their pocket, when they can quickly review notifications, alerts, text messages, emails and so forth, on a wristwatch. I hardly ever pull my smartphone out of my pocket now that I have the Apple Watch. The watch is a portal to a better, uninterrupted workflow. Evan J. Kline is a personal injury and wrongful death attorney at KBG Injury Law. He is a member of the York County Bar Association, where he serves as the co-chair of the Civil Rules Committee and a member of the Bench/Bar Committee. He is also a member of the Million Dollar Advocates Forum, the Pennsylvania Bar Association and Pennsylvania Association for Justice. Contact him at ekline@kbglaw.com.